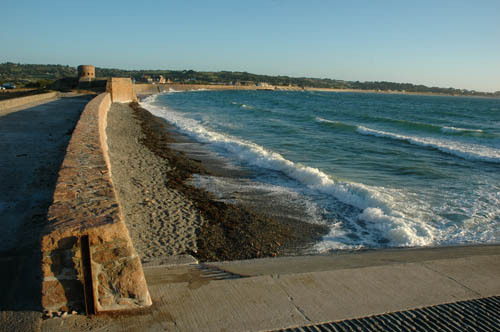 Vazon Bay, or as the Germans called it, Rundbucht, is situated on the westside of the island. It is one of the biggest open bays on the island and was therefore heavily defended. The most impressive strongpoint is Stützpunkt Rotenstein (Fort Hommet). Although most of the bunkers are covered or closed, the outsides are still visible and one of the 10.5 casemates has been converted to its original wartime state. Going down one comes along Wn Rundturm around the old Martello tower, with a 4.7 cm Pak casemate nicely covered with granite stones. There are also some nice small positions. Near the Grand Mare hotel is Wn Rundbucht-Mitte with an Unterstand WaKoFest and another 4.7 cm Pak casemate. Two more of them are to be found in Wn Margen near the Vazon Bay kiosk. Along the road on the landside is another Unterstand WaKoFest and a Tobruk. Going further down to Le Crocq headland is Wn Krossen with a Jägerstand, an Unterstand WaKoFest and some small positions. In the higher grounds inland there were four Widerstandsnesten: Schonfeld, Gabelsberg, Königsmühlen and Heiligenberg. Most of them comprise of reinforced field order positions and are covered in dense vegetation or gardens. Recently (2008) Festung Guernsey started uncovering some of these positions in Wn Königsmühlen. The results are worth a look. At Wn Gabelsberg there should be a very rare (one out of two known in the Atlantikwall) L 414A. However it is on private property and can not be visited. Overlooking the bay on a sunny evening.